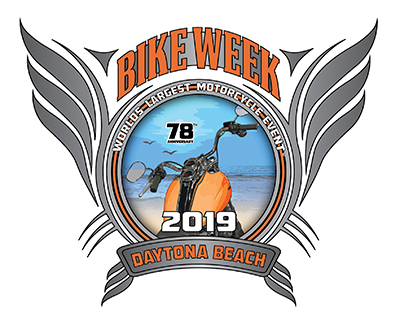 John Michael Washe won the "2019 Official Bike Week Logo Creation Contest". We recognize John's as the official logo creator in both print and on-line. I’m the son of a graphic artist and art teacher. When I was in my early teens I watched my mother do illustrations and lay out a quarterly publication for the city of Norfolk Virginia. I was so proud of her and thought it was the coolest thing that she was doing something important for the city we lived in. I never intended to be a graphic artist at the time, but I guess she influenced me more than I realized. I consider it a huge honor to contribute to my chosen city now. Some of the past work I am most proud of include the logo for Halifax Urban Ministries, while with Frazer-Berner Advertising, and the Sixtieth Anniversary poster for the Peabody Auditorium, while with Image Makers Advertising. Ive also done photography for the DBCVB. My most recent design work was the program for the Nutcracker for the Volusia County Civic Ballet. (I guess you could say my work is pretty diverse:) I’m not sure what can top the official Bike Week logo other than hopefully doing it again next year! I’m currently working as a graphic design and online marketing for Florida Gun Exchange. As for the process, I had some conceptual designs in the works when a friend passed along the Chamber’s call for submission. From there, it was a bit of a challenge to convert what I felt were some good design concepts into a finished piece in time to submit my design at the last minute. For this piece, the art was created from my photos. The background photo was already in my collection but the reference photo bike was shot at the last minute In Bruce Rossmeyer’s showroom.